with an official release date on November 24th. While the project has seen a heavy campaign with singles “Pills n Potions” and “Anaconda,” the Queens-based rapper and 1st lady of YMCMB furthers her promotional efforts with the announcement today of a major single. 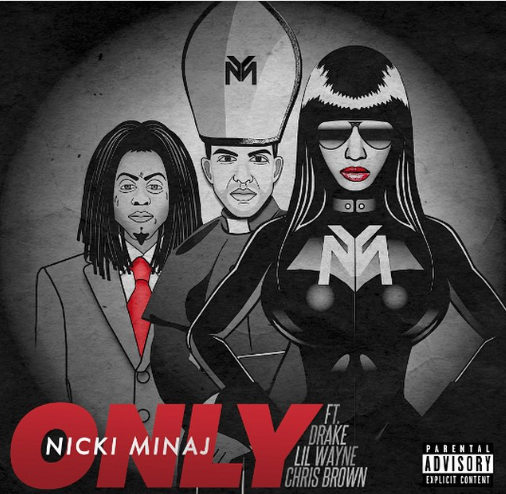 This Tuesday, Ms. Minaj will be releasing her next single “ONLY” featuring Lil Wayne, Chris Brownand Drake. While the track is set to premiere on October 28th, an interesting note is the Breezy and Drizzy feature will be their official reunion – making it the pair’s first time on a new track together in over four years. Whether Nicki is able to dethrone “Loyal” as the biggest collaborative track in the urban world remains to be seen, but we’re sure an assembled cast of the biggest hip-hop heavyweights will not be a flop.